Folks who know Steve as a guitarist might do a double-take to be sure this isn't an instrument. 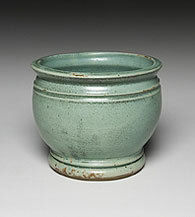 Procter pot, only 8" x 8"
Humans have been firing pots for at least 12,000 years, and using them to fulfill the most basic needs -- ewers for water, bowls for porridge, funereal urns for bodily remains. No wonder we have developed an elaborate mythos of clay as flesh, and vessels as human forms. But it doesn't take any special belief system to delight in the gooey clay, the miracle of wheel-throwing or the sensuous curves of a finished form. Pottery is in our blood. 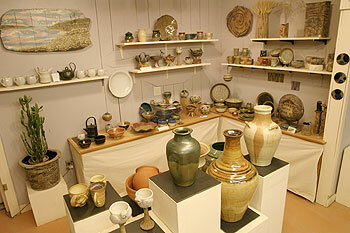 by over a dozen local potters. Many members of Brattleboro Clayworks, the cooperative clay studio on Putney Road, speak of their work with clay as though it were inevitable -- almost unpleasantly so. "I was kidnapped by clay," founding member Alan Steinberg jokes in his statement on the group's website (www.brattleboroclayworks.com). 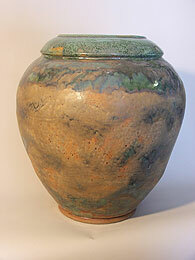 "My creativity is grounded in clay," writes Roberto Cartelli. Kathy Preston describes herself as slipping into a "meditative trance" while working. The words "addiction" and "hooked" come up a lot. Perhaps this partially explains the success of Clayworks, which, in its 24th year of operation, has 14 professional members, 10 renters and a set of very popular classes and workshops for beginning- and intermediate-level potters. The other part of the explanation, of course, is the work itself -- all of high quality, but remarkably diverse in size and style. Tiny bunnies, delicate bowls and pleasantly weighty coffee mugs grace the showroom alongside rolled slabs imprinted with plant matter, minutely detailed vessels in the forms of totemic creatures, and large-scale garden pieces. This spring's "Garden Show" will begin during the Memorial Day open studio weekend, and will feature planters, bird feeders, garden sculptures and other outdoor pieces. 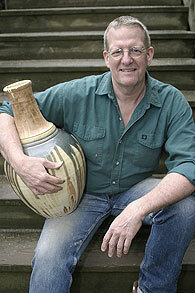 For May, Clayworks features the impressive work of potter Steve Procter, also an accomplished musician and fund-raising consultant. Procter's vessels, like the man himself, are unmistakably large but not at all imposing. "Ever since starting with clay, I have been drawn to make large pieces," Procter says. "I love the way a substantial pot emanates its presence, and I enjoy the process and physicality of creating a piece that relates with me on equal footing." After two weeks of what he referred to as "throwing boot camp" at the World Pottery Institute in Florida, Procter has been trying a few new things, some of which I had the privilege to witness in the studio. He sits at the wheel and begins lumping together several plugs of clay. It looks like a lot, but I am having trouble believing he can turn that amount of stuff into a 30-inch-high vessel. It turns out I am right: he throws the largest pieces in sections and then skillfully joins them together on the wheel before firing. This section will fit atop one he made a day or two before -- just for demonstration purposes, he thinks, because the other section is probably too dry to make a good bond with the fresh one. 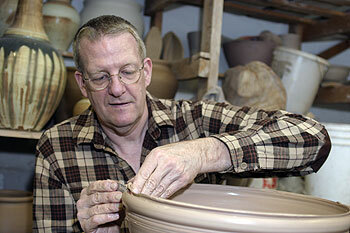 Procter uses generous handfuls of water as he pads and centers the piece, explaining that after "boot camp" he began experimenting with softer clay. "It's more responsive," he says. "The downside is that it's harder for the clay at the bottom to sustain the weight above it. But for the ease of throwing, that's a trade-off worth making." 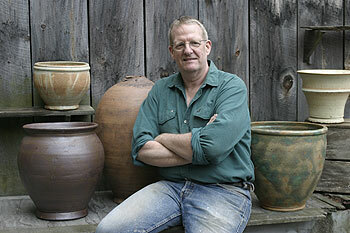 large garden pots and vessels. As the wall forms, Procter picks up a "rib" to refine its tightness and define its curves. When he notices a wobble (something I can't perceive), he explains that he's "still finding out what the limits are" with the soft clay, and corrects it. Then he takes out his calipers -- not a measuring tape -- to help him size the opening of this piece to match the opening of the already completed section. He stacks one on top of the other and begins slathering them with fresh clay in order to fuse them. When he is done, you -- or I, at least -- can't tell they were once two pieces. He decides this one might be a keeper after all. "It's sort of puzzle-like and sort of challenging," he says. "Throwing gives me immediate satisfaction, and this process is more like hand-building." While his technique may look difficult, Procter thinks making small pieces would actually be harder for him. "I look at people who are making tiny, delicate things, and I think, 'How is that possible?' For me, this is a more natural scale." Procter takes care to ensure that his large work does not overwhelm its surroundings or its viewer. 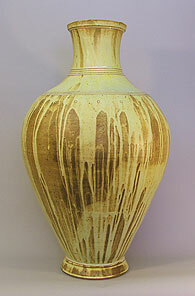 Creamy glazes enhance the vessels' curves and allow these pieces to speak from their shapes rather than their surfaces. "I am interested in strong forms," Procter says. The matte finish helps the piece "invite people in." Not unlike my gentle, welcoming host. 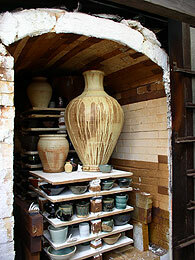 Some of the relationships between a ceramicist and his or her work are obvious. For example, it is easier to make small pieces if you have small fingers. Others are less obvious to outsiders, but the artisans, who meditate daily at their wheels, almost universally describe their work as a reflection of themselves -- a physical relic of their own groundedness, centering, opening or growth. Procter is no exception. Clay work "engages mind, body and spirit," he says. This has its drawbacks as well: a disorganized mental state is the potter's worst enemy. "If you come in upset, distracted, not centered yourself -- you can't hide it," laughs Procter. "You get what you are." He focuses silently on his work for several minutes. I feel that I have nearly worn out my welcome, but I linger in the studio just a little longer, watching new walls rise and listening to the long, soft Om of the turning wheel.